The average auction commission is 25% plus additional charges for such things as photography, restoration, and shipping. Auction houses have long been the primary vehicle for buying and selling large carat diamonds, precious gemstones, important estate jewelry, and limited-edition timepieces. To sell the world’s most treasured fine jewelry and watches, an auction house needs to have access to both the items and the clientele who might be interested in buying them. 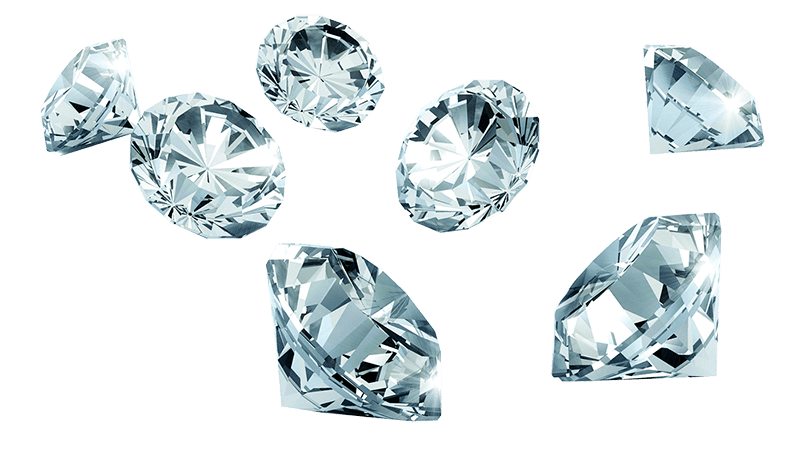 Auctioning diamond jewelry and watches is thus a carefully coordinated dance that involves bringing the items to the attention of the proper audience, one that will have the greatest likelihood of bidding on a particular lot. 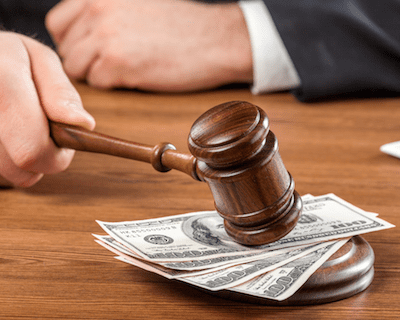 This means that auction houses must spend a lot of time, energy, and work in promoting their auctions and lots — the cost of which is taken from the final hammer price of the diamond jewelry or timepiece. The average auction commission is 25%, which covers marketing and insurance costs. On top that there may be additional charges for such things as photography, restoration, and shipping. All things considered, you may be receiving 30% less than the final hammer price. For example, if your item sells for $30,000 at auction, the cash amount you receive could be $21,000. Large auction houses also attach a “buyer’s premium” of around 25% to items sold for less than $300,000. That is an extra 25% that the buyer must pay on top of the final hammer price. Buyers will take this fee into consideration when bidding on your item. It thus can substantially reduce their bid amount and the final hammer price. If you have an incredibly rare diamond, such as a 5-carat vivid pink flawless, or a nearly one-of-kind timepiece, such as Eric Clapton’s Patek Philippe 2499, then an auction might be a good alternative — as you could attract international collectors and a buyer frenzy to compensate for the high auction fees. 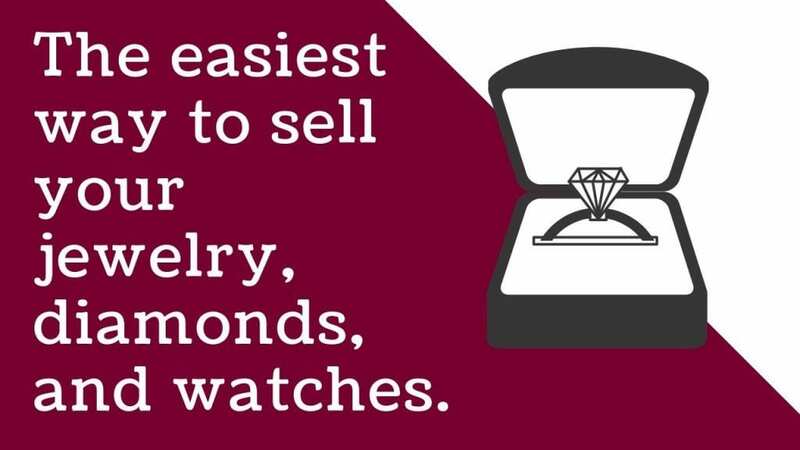 However, for the vast majority of the diamonds, watches, and jewelry on the market, it doesn’t pay to send them to auction. 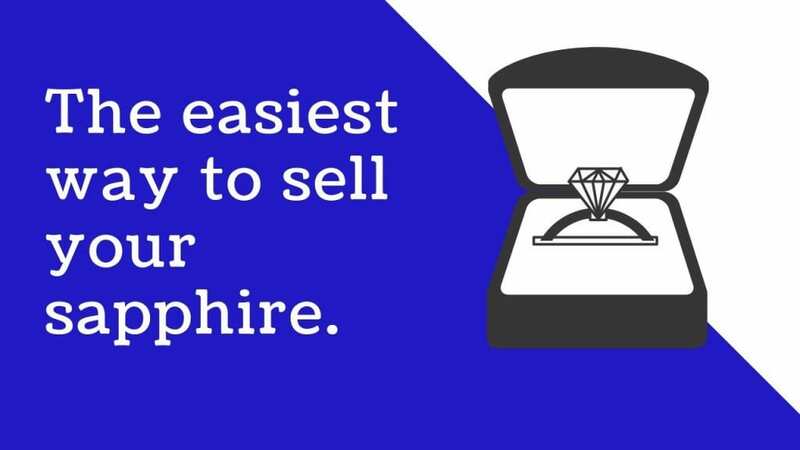 Sellers choose Diamond Estate Jewelry Buyers versus auctioning their diamond jewelry and because they can sell their item quickly with 0% fees, while at the same time be assured that they are getting a generous cash price. 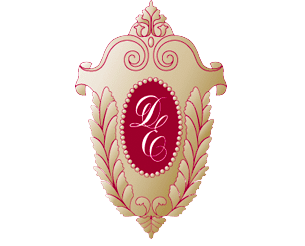 Diamond Estate has an exclusive buyer’s network and low business overhead that allows us to pay the highest possible prices for fine jewelry and watches from Tiffany & Co., Cartier, Harry Winston, Van Cleef & Arpels, Graff, Rolex, Patek Philippe, Audemars Piguet, and others. Please take a few moments to read what our clients have to say about selling their fine jewelry, diamonds, and watches to us. As an A+ BBB rated jewelry buyer, owned by prominent estate jeweler Carl Blackburn, you can be confident in our ethical standards and commitment to clients. The quick and easy selling process begins with a free market appraisal of your item that estimates the price range of our cash offer. Find out how much your item is worth by contacting us now. 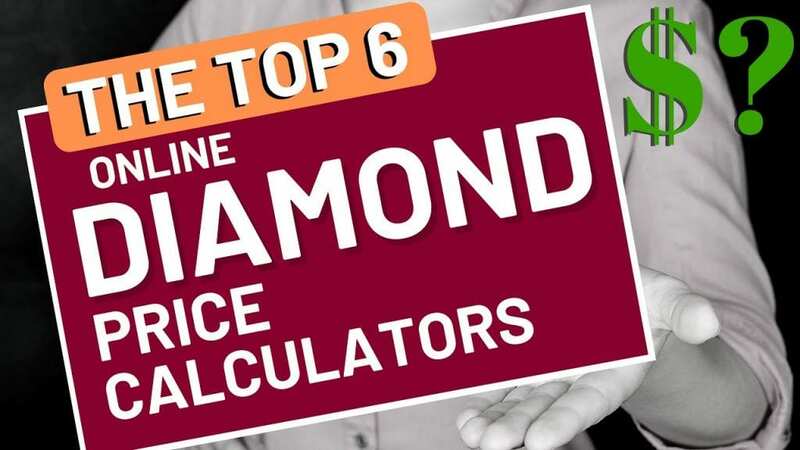 For those sellers who still would like to explore how to auction diamonds, jewelry, or watches, we have compiled a list below of the most important auction houses to consider when selling expensive diamond jewelry and timepieces. Founded in London in 1744 by bookseller Samuel Baker, Sotheby’s is the fourth oldest auction house in the world, and has always been a leader in the auction world. Now with ninety locations in forty countries, Sotheby’s was one of the first auction houses to recognize the importance of being a global presence — they were the first to hold auctions in Hong Kong and the former Soviet Union. Sotheby’s boasts 250 auctions each year, with sales in over seventy categories, including fine wine, international real estate, furniture, Old Master paintings, and of course, estate jewelry and watches. In addition to their global presence, Sotheby’s also offers BIDnow, a service that allows clients to watch auctions live online and place bids in real time from anywhere in the world. With a deeply established client base all over the world, Sotheby’s is certainly one of the most successful auction houses of all time. Total sales for 2018 was $5.3 billion. Christie’s has been the world’s top auction house for many years. Another global presence, Christie’s now has over eighty offices in forty-three countries, and a network of buyers and sellers that is unparalleled in the auction world. Founded in 1766 by James Christie, the storied auction house has sold fine and decorative arts, including jewelry, collectibles, and wines, for prices ranging from $200 to over $100 million. In 2018, sales topped $7 billion, an all-time auction house sales record. Auctioning jewelry and watches has long been a mainstay at Christies. Their watch division, Christie’s Watch Shop, not only offers some of the most important watches in the world, but now does a significant part of its business through Christie’s Private Sales, connecting collectors with specific watches outside the traditional auction format. Jewelry sales are also moving into the 21st century for Christie’s. With a philosophy based on accessibility to art buying, Christie’s has been expanding its online-only auction platform, with dozens of online-only sales last year. Over forty percent of buyers in these sales were new to Christie’s, showing that their pursuit of the all-important client base successfully continues into the future. Based in Great Britain, Fellows & Sons Ltd. was founded in 1876, when William Henry Fellow was left with an unwanted order of bicycles and decided to sell them at auction. Fellow’s sons continued the family business, selling items from refugees of the Russian revolution, and later from some who fled Nazi persecution. Built on a solid reputation for selling fine jewelry, Fellows continued to expand in the late 20th century, opening departments in Fine Art and furniture. Most recently, Fellows separated off their jewelry and watch division to create individual, specialized auctions. 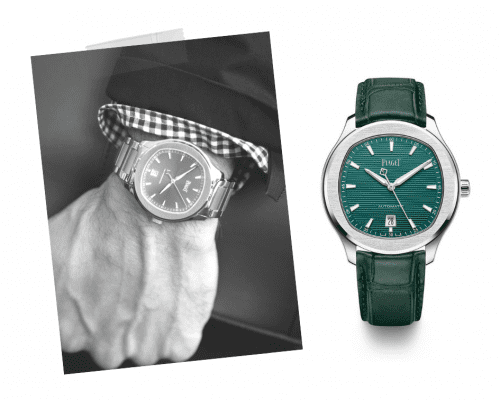 In watches in particular, Fellows tends to offer less expensive lots, making it a good choice for new collectors who wish to buy watches to build a collection. 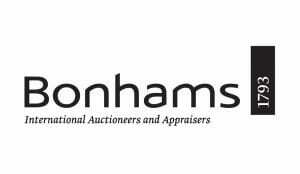 Another traditional British auction house, Bonhams is privately owned, and one of the oldest and largest auctioneers of fine arts and antiques. Bonhams is known for its expertise in high-end items, especially automobiles, and has established itself as London’s most important jewelry auction house. The firm has achieved record prices in diamonds, colored stones, and even a world record in 2013, when a fancy deep-blue diamond sold for £6.2m. Thanks to recent mergers with specialty auction houses, Bonhams has also claimed market leadership in sales of watches and clocks. Established in Geneva in 1974, Antiquorum is exclusively dedicated to selling modern and vintage timepieces. Their relatively short history has been spent successfully cultivating a thriving collector’s market for timepieces worldwide. Already established as the leader in selling wristwatches at auction by the 1980s, Antiquorum pioneered the “thematic auction” dedicated to a single subject. 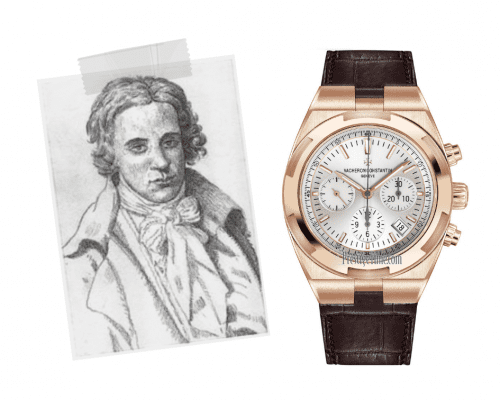 Their first such auction, “The Art of Patek Philippe,” marked the 150th anniversary of the prestigious watchmaker, and led to many sales records. Antiquorum was also one of the first auction houses to offer full online services, and continues to lead the industry in online, real time bidding, as well as in access to catalogues, sales results, and watch databases. Established in Dallas in 1976, Heritage Auctions is the largest auction house founded in the United States. A privately-owned company that now has offices throughout the US and in Europe, Heritage Auctions is the largest auctioneer of collectibles in the world, combining live internet bidding and proxy bidding with traditional floor auctions for an unprecedented level of participation in their auctions. In 2018, they boasted over 1 million registered online bidders. In addition to collectibles, Heritage is one of the largest and most respected auction houses that handles fine jewelry. With a mission statement that includes the claim that “unbiased information can and should be available to all,” Heritage Auctions prides itself on its transparency, integrity, and expertise. Their addition of four respected jewelry experts to their team has made the fine jewelry department one of the largest in the firm. 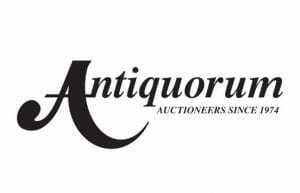 Heritage Auctions is the largest auctioneer of collectibles in the world. The success of Heritage Auctions as a trusted auction house for fine jewelry is measured in both the quality and the quantity of the pieces they offer at auction. At Heritage’s Spring Fine Jewelry Signature Auction for 2017, the house realized a total of $3,173,738 in net sales from over 400 bidders. 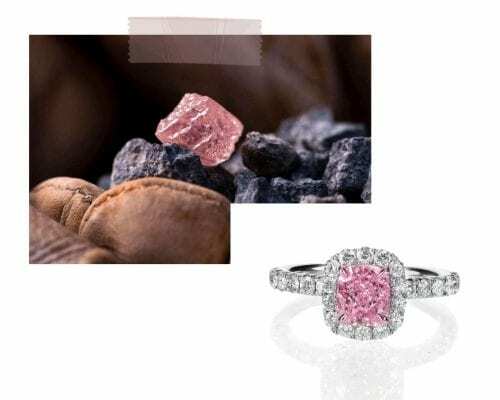 Notable pieces from that sale included a captivating Kashmir sapphire, diamond, pink gold ring that sold for $175,000. The modified, sugarloaf-shaped sapphire cabochon weighing 12.70 carats was set in 14k pink gold with rhodium finished accents, with single cut diamonds accenting the featured stone. Another beautiful ring that sold was a Cartier diamond set in gold, featuring a stunning, 3.01 carat round brilliant-cut diamond, enhanced by full-cut, channel set diamonds on the top of the 18k gold shank. The GIA report on the center stone stated E color, VVS1 clarity, and the piece sold for $77,500. What About Online Jewelry Auctions? 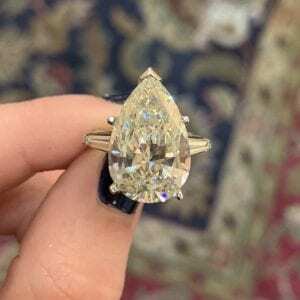 A large carat diamond ring recently purchased by Diamond Estate. 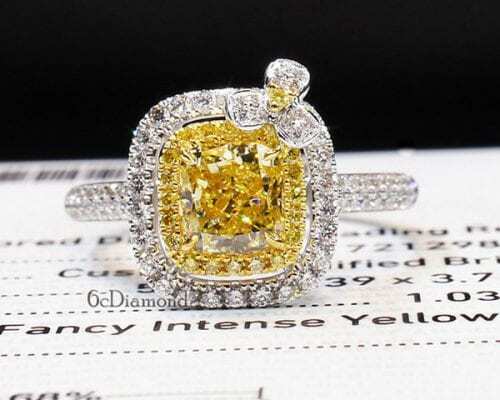 Recently a new type of auction house has emerged: the jewelry auction website. 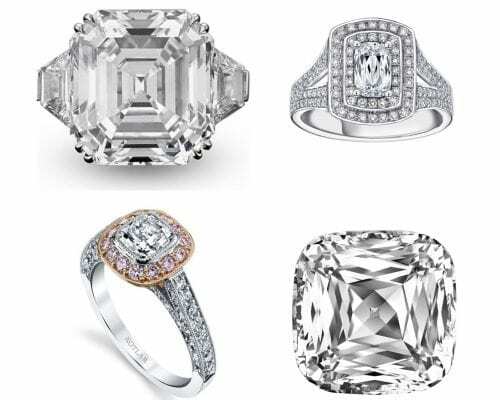 These are website-only businesses dedicated to auctioning diamonds, jewelry, and expensive watches. The problem with these websites is that unlike traditional auction houses the people bidding on items are industry buyers. At an auction like Christie’s or Sotheby’s the bidders are private buyers (i.e. members of the public). 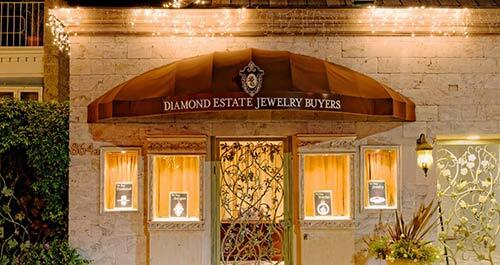 But at an auction website the bidders are professional buyers who plan to re-sell your item to a jewelry stores. The online auction is thus taking a 20-30% commission for connecting you to an industry buyer — which is entirely unnecessary. 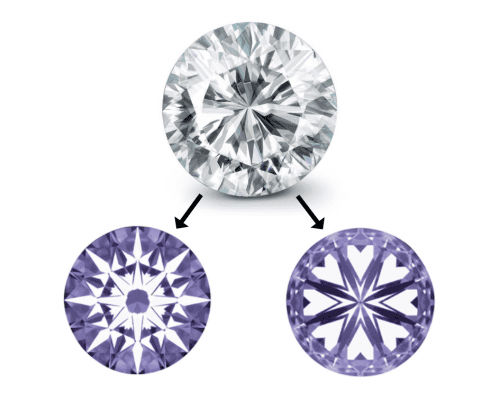 Why get 20-30% less for your diamond jewelry or watch, when you can sell directly to Diamond Estate with 0% fees? Contact us today for a free consultation. Are you interested in selling a limited-edition Rolex or Patek Philippe watch? Read our article on How to Sell a Rolex or How to Sell a Patek Philippe.